Shova returns in her new sari, this one silk and gilded with rich gold and green. Her tuile veil is replaces by a traditional wedding veil, criss-crossed with shiny gold foil trim. 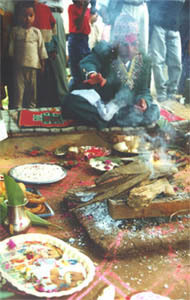 A white khatta, prayer scarf, is placed over both their shoulders, but it falls into his lap. The rituals continue...the new couple following the priest's lead. Tossing rice, water, and other things into the fire, as instructed. At one point, they stand up and with Tika behind her, his hands around her and clasping hers, together they throw rice down onto the fire. Then they walk three times around the small canopy, stopping at each cardinal point. 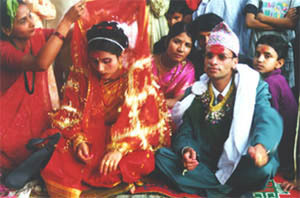 At times, she leaves and only Tika remains to carry out the rituals as he prepares himself to take on this new responsibility. At times, near tears, she tries to retreat into her veil, but her sister pulls it away and off her face. Finally, the moment everyone has been waiting for. A white sheet is folded into a long ramp and one end held at her forehead. Tika is given sindoor, special red-orange powder in his palm. 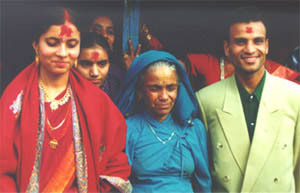 Starting at the far end of the sheet, the sindoor is ritually spread along the sheet up to her forehead and then pressed into the part of her hair. This is repeated three times, and the most important part of a wedding ceremony. They are now married. Everything else is fluff. 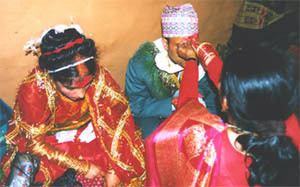 If, at any time, a man places sindoor in the part of a women's hair, they are absolutely married in Nepalese culture. Once married, all Nepalese women will wear sindoor in the part of their hair for the rest of their lives, until their husband dies, then they must stop. 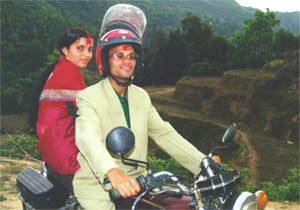 Widows may never wear red clothes or receive a red tika. Instead they opt for white, blue and yellow with only white and yellow tikkas. Her sister takes out a small hankerchief, folds into a square and pins it into her hair over the sindoor, covering it completely. Her father or male relatives are not allowed to see it on her forehead on that day, representing as such, her entrance into womanhood. Finally, the rituals are over. A light rain as started. The men begin to take out the chairs and table at which they sat, and load them into the waiting truck. Other items are brought out from the house. A darage, a large metal locker that Nepalis use for clothing storage as home do not have closets, a fan, copper water vessels, a dining table and chairs, and a cow, a God in their new home. These things represent her dowry. Tika, for his part, tried to refuse the dowry, but they insisted on some things. 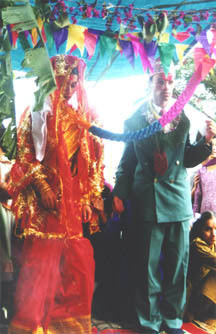 Weddings I have been to recently in Kathmandu were completely over-the-top with dowries that soared above $10,000 US dollars. This is Nepal's new monied class. You have to pay for membership. Shova is now crying. Her three younger sisters lead her into the van and stay with her, trying to reassure her, wipe away her tears while the final preparations are made to leave. Tika comes and we load into the van. She is staring out the window at her home, as we pull away. The van, the bus, and the truck now laden down. The journey is slow now because of the rain which has picked up. The road to the village side is wet and muddy. We reach the base of the mountain and begin a gruelingly slow journey back up to Tika's home. A deep quiet has come over the group. There is not the same singing as before. Having left late, it is now dark and the trail completely unlighted. Sarita, my Nepali sister, is walking with Shova trying to hold an umbrella over her head and lead her across the unfamiliar terrain. In her platform shoes, she almost falls many times and that only increases her crying. Sarita brought for me an extra umbrella, which I share with the video-man. He is hogging it all for his camera, so I walk ahead and get drenched. We finally arrive back at Tika's home. The rain has driven the women into the house and they are spilling out into the shelter of the front porch. They are still singing and dancing. As the first of our group straggle in, they bombard us with questions. But I just sit on the floor exhausted from the climb. 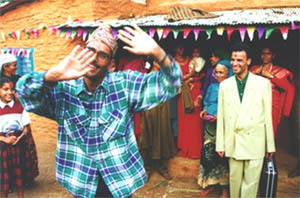 Soon, Shova and Tika arrive and she is immediately hussled into the house to an area already prepared for their arrival. They are seated on the floor and the women gather around tightly, trying to see her face, to see her beauty. The married women, one by one, bless the new couple with tikka and envelopes of money, but with a new twist. Each time, the new bride must get up and genuflect, kneeling all the down and touching her forehead to the women's feet to show great respect for the commnity of women, of which she is the newest member. 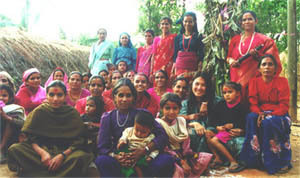 Me, center right, and the mother's committee of Chitopani, as they like to be known. Once all the women had blessed them, the ritual was finally over. They ate a meal together while people milled all about, more casual now. Outside, the women were still dancing and singing, as they had been all day, and this time, the men of the entourage joined in. The rain abated and people were in no mood to stop. Singing contests began, with groups of men challenging women. A chorus would be sung by all, then one side would sing a verse, in flirtation, followed by the chorus. Then the member of the other side would have to retort, the saucier the better. The madal, a Nepali drum, was played during the chorus and members of both sides would spontaneously jump up and dance, then pause and eagerly await the next raunchy verse. The next day dawned and the festivities continued. The local men cooked a huge meal and the women served it. they burst in dance. Look Devi Uncle go. I finally got Shova to smile for a photo. Here she is with her new husband Tika and Tika's mother. P.S. I am glad to note that their relationship was consumated pretty quick because exactly nine months later she gave birth to little Sanu, a sweet baby girl.